A filler issue it was, but Batman #44 truly was an emotional comic that really explored the greatness that is the character of Batman, and why he truly is a necessary figure. This issue definitely felt different, but different in a good way. So let’s dive into Batman #44! Non-spoiler thoughts first: Amazing issue! 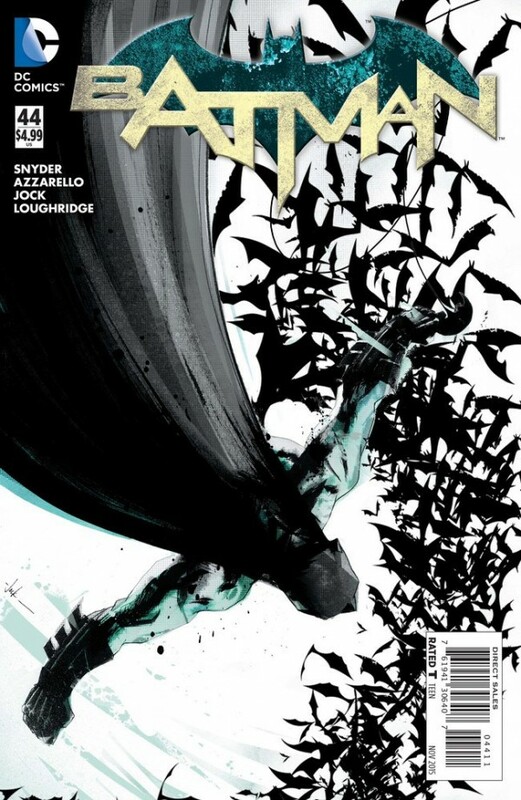 Scott Snyder teamed up with the wonderful Brian Azzarello and artist Jock to give us a flashback issue that was supposedly exploring the origins of the current Bat-villain, Mr. Bloom. And as an origin story, we didn’t really get anything at all. However as a Bruce/Batman story, we got a truly moving story. Maybe it’s because I’ve missed Bruce in the Batman comics, but Batman #44 was the type of well-written, well-illustrated issue that reminds you how great Batman is. The world of Gotham is complicated, dirty and in need for change. Batman is that force for change. The story was a small-scaled one driven by human drama, and is definitely worth the read. It doesn’t do much to help move the current Gordon/Batman story forward, but it does work well as a stand-alone Bruce/Batman story. Anyways now on to spoiler talk for the issue. Spoilers for Batman #44 follow! The story opens up to powerful imagery of a dead boy, Peter. He was shot, but died from the impact of a fall. The tone of the issue is set, and the change in art from the previous Batman comics is understand. The rough, gritty nature of Jock’s art perfectly fits the tone the comic is going for. The city is in ruins after Zero Year, and Batman intends on doing something about it. However this is still the beginning of Batman’s career, so he isn’t exactly sure about the way to do that yet. His goal to catch the person who did this to Peter, to help save the city. This leads us to Penguin (who he anticipates perfectly), and we find out about Peter’s connections. His dad owned a business that they had to give up. They knew either way it would go to a gang, but they didn’t want that gang to be the same one that took their brother. So out of desperation Peter gives the store to Penguin, to keep it out of the rival gang’s hands, the ‘Four Fives’. Penguin betrayed Peter and gave the store to the Four Fives as a peace-offering. This angered Peter and he goes to confront the Four Fives, but that all backfires in his face. A cop is called to the scene and ends up shooting Peter. Issues of police brutality and corruption bring a real world feel to the issue (making me wish even more that Batman was real). 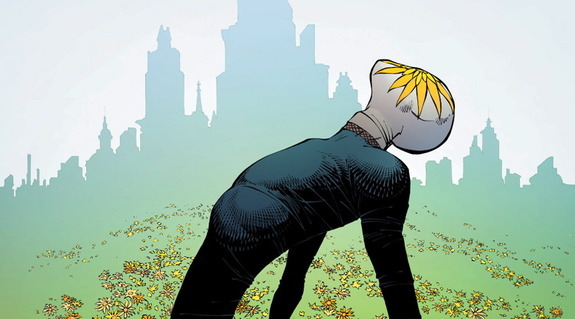 After Batman goes to Peter’s father’s hospital room he is lead to Mr. Bloom by Peter’s friend. Turns out that Peter felt so powerless and hopeless that he wanted something to help him. He wanted to be able to do something, to push back like Batman does. He ends up doing business with Mr. Bloom and ingesting one of Mr. Bloom’s mutating concoctions. As we know Mr. Bloom’s concoctions give the user temporary mutant abilities, but it’s also deadly. After getting shot Peter uses the concoction which gave him the ability to fly, to escape it all. Unfortunately whilst flying he falls and dies. And in a powerful line we see a change in Batman’s character, “Because there was someone to catch…the one to catch was the boy. Before he fell”. At first he thought that he needed to save his city by catching the bad guys, but Peter made him realise it’s more than that. It’s about catching people before they fall. About helping the people of Gotham before it’s too late. About being proactive not reactive. 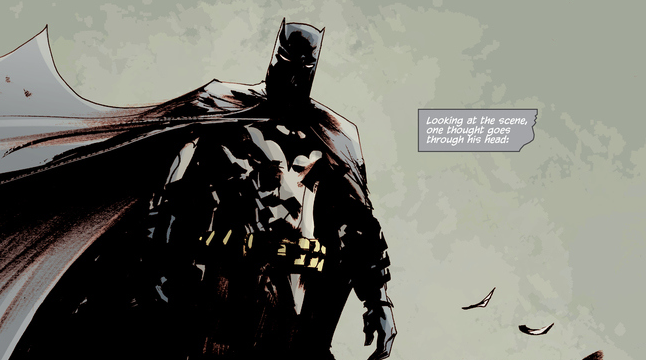 From that forged the Batman who is a symbol of fear for criminals, but also a symbol of hope for the people of Gotham. Someone who is there for them when they need it. Someone who can change things for the better before it’s too late. And doesn’t it make you wish Batman was real? As society is constantly crushed by those immoral people who believe that they have the power, you would want someone to remind you that you don’t have to accept that. That you can be better and live in a better world. The issue is threaded with newspaper articles that highlight the complex nature of Gotham. The splash panel of Batman standing over Gotham with the newspaper articles coiling around the city perfectly illustrated how complicated Gotham is. Criminals run the place and the authority can’t be trusted. Solving the case of Gotham isn’t simple. It’s not just about catching the bad guys. And it’s the case of Peter that helps Batman realise this. It’s why at the end of the issue we see him talk to the kids he previously scared away. Overall Batman #44 was more of a stand-alone issue than it was a Mr. Bloom origin issue, and it doesn’t bother me one bit. Batman is such an amazingly intricate character who is working in a city that is just as an amazingly intricate character itself. Change can’t be made by just catching the bad guy. Change has to be made by having your finger on the pulse of the city and understanding the people. Batman can’t just be a faceless monster to criminals, he needs to be a figure that is there for the people of Gotham, to inspire hope and bravery. 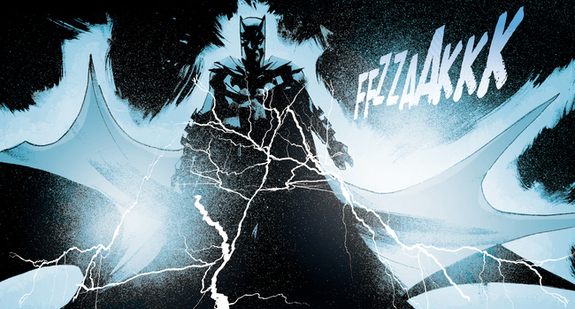 Batman #44 showed us how he came to be the hero he is now (or was). Snyder finally got to do the smaller, detective story he’s been saying he’s going to do for a while, and gave us some fantastic character moments with it. 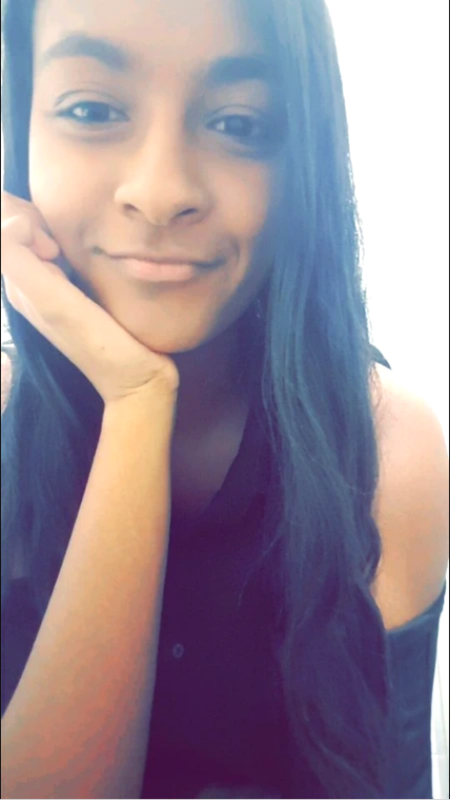 9.2/10. Avengers: Age of Ultron a failure? Calm down now. Love the artwork in this.